Prepare a large baking sheet/s. Arrange the slices on the baking sheet. In a bowl combine the melted butter with minced garlic. Drizzle or brush the melted butter/garlic mixture over the top of the bread slices, then sprinkle lightly with kosher salt and black pepper. Bake for about 15 minutes, remove from oven, turn over the slices and brush again with butter, then kosher salt and pepper; return to oven and continue baking for 1 hour or until golden brown, turning every 15 minutes. 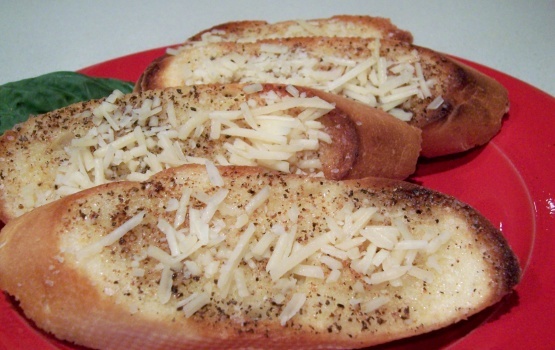 Immediately after the slices are finished baking, sprinkle the top with grated Parmesan cheese.